More than half of photojournalists admit they sometimes stage images, according to a global survey on photojournalism. When asked if they stage photos – by asking subjects to pose or repeat actions, for example – 36% said ‘never’ but 52% said ‘sometimes’. A further 12% said they staged at least half of their photos. 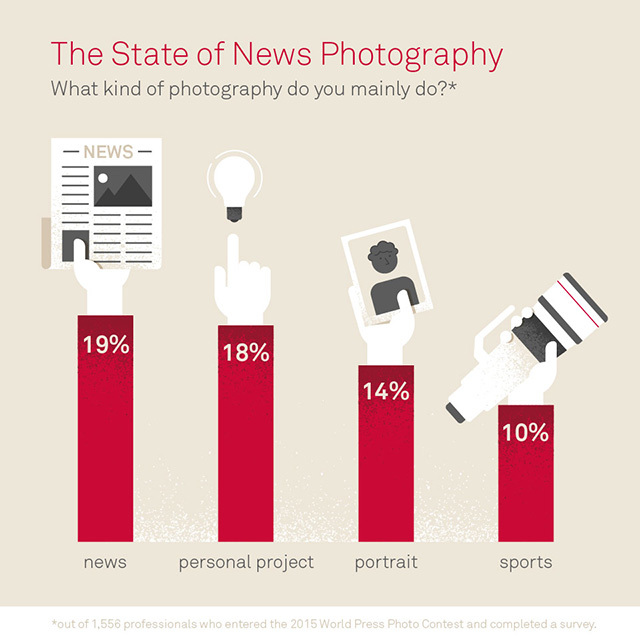 The findings are published in a survey on the state of news photography, which received responses from 1,556 photographers in more than 100 countries. Only 10% of photographers said they never enhance the in-camera or raw files by altering contrast, hue, tone or saturation. However, 51% said they do this ‘often’ or ‘always’. The 63-question survey also reveals that professional news photography is dominated by men – 85% of respondents were male. And Facebook was by far the favoured social media platform, with 62% ranking it as their number one. Instagram and Twitter lagged far behind. The poll also found that most professionals do not see citizen photographers as a risk to their livelihoods. 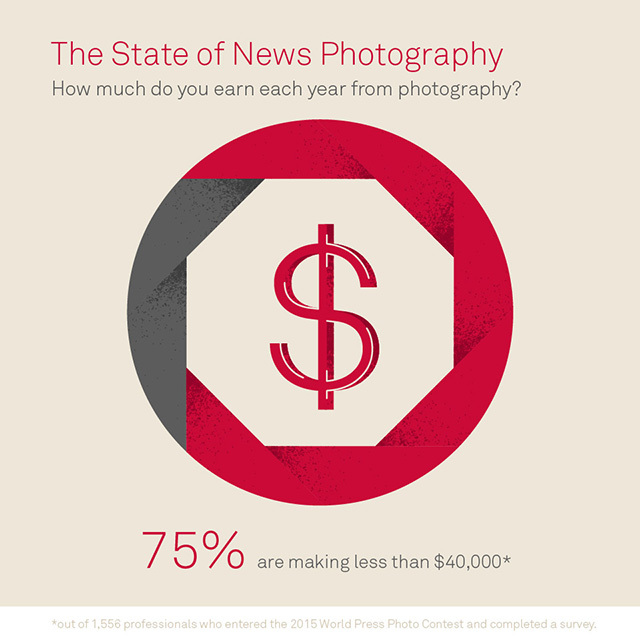 The survey, by the World Press Photo Foundation and Oxford University’s Reuters Institute for the Study of Journalism, concluded that photographers’ earnings are ‘very low’. Three-quarters of respondents said they earned less than $40,000 per year from photography, and one-third make $10,000 or less. Dr Adrian Hadland, director of Journalism at the University of Stirling, and the report’s lead researcher, said: ‘As journalism scholars we knew things were changing fast for photojournalists as a result of rapid developments in technology, the restructuring of the news sector and the emergence of citizen journalists armed with smartphones. World Press Photo Foundation managing director Lars Boering said: ‘The World Press Photo Foundation supports professional photographers and visual journalists in their work. ‘Collaborating on research to inform the community is one of our important functions, and we are delighted to both share and learn from these important findings. 1. 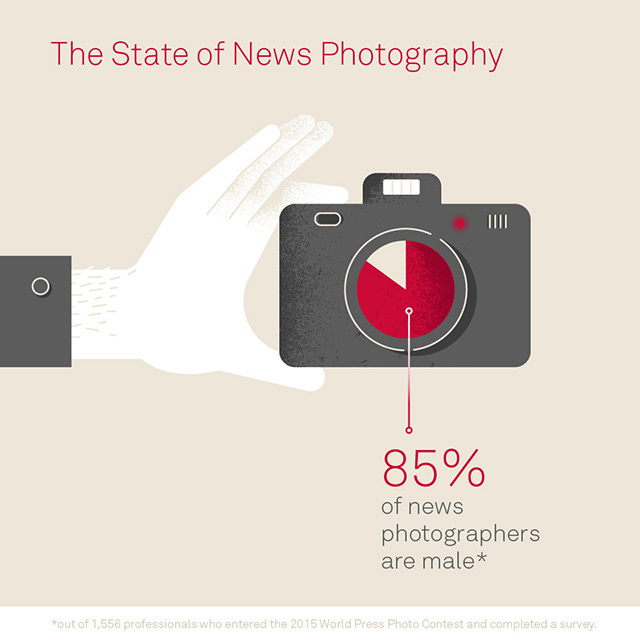 Professional news photography is dominated by men, with 85% of the respondents male. 2. The majority of photographers (60%) who responded to the survey were self-employed. 3. Three-quarters of the respondents work full-time as photographers. portraiture (14%), and sport (10%). 6. Photographers largely work alone (80% of respondents). study concentrate on stills photography, the overwhelming majority (93%) indicated that, given the choice, they would prefer to do still photography only. One-third work with video, either through choice or necessity. 8. Photographers are generally highly educated; more than two-thirds of our sample have university-level qualifications, although one-quarter have no specific photography training. 9. Photographers’ earnings are very low, with three-quarters making less than US$40,000 per year from photography, and one-third making $10,000 per year or less. Despite this, most say they are managing financially or are feeling good about their financial situation. 10. The unauthorised use of photographs without payment is widespread. An overwhelming majority of photographers in this study have been affected by this, with most receiving no compensation. 11. Photography is a potentially dangerous occupation, with more than 90% reporting they felt vulnerable to the threat of physical risk or injury at some point during their normal duties. According to the views of respondents, South America, Central America and the Caribbean are the most dangerous regions of the world to work in, while Europe and North America are the safest. 12. Responses confirm that the digital era has added new complexity and uncertainty to the professional ethics of photojournalism, and almost all the photographers in this survey feel that understanding ethics is important. However, some of the practices reported by photographers suggest current ethical guidelines are not adhered to in some circumstances. 13. There is an industry consensus that rejects the manipulation of photographs by adding or removing content, and 76% of photographers regard manipulation as a serious problem. Of those identified as mainly news photographers or photojournalists, 75% said they never alter a picture, with the remaining 25% saying they alter the content of images (other than by cropping) at least sometimes. 14. When asked if they stage images (i.e. ask subjects to pose, repeat actions, or wait while the photographer gets ready), 36% said ‘never’ but 52% said ‘sometimes’ (with a further 12% saying they did so at least half the time). 15. Only 10% of photographers never enhance the in-camera or RAW files by altering contrast, hue, tone, or saturation, with 51% saying they do so often or always. 16. While some feel that amateur or citizen photographers constitute a risk to their livelihoods, most photographers feel either neutral about it or see it as a positive development. 17. When it comes to working online, 63% of respondents say a personal website is important or very important to their work, while more than half say they often or always use social media as part of their work, with only 11% never using it. 18. Facebook is overwhelmingly the favoured social media platform for photographers in this study, with 62% of those surveyed ranking it first, and another 26% making it second or third. Instagram and Twitter follow along behind. 19. Three-quarters of the photographers surveyed say they have received benefits from social media, with 40% saying the benefits are non- financial, and 23% saying they have been financial. 20. Notwithstanding the low financial rewards, industry challenges, and physical risks, the survey evidence suggests that there is a high degree of job satisfaction, creative expression and personal reward among professional photographers. Two-thirds of the respondents said they were happy with their choice of livelihood, and 55% feel mostly or always positive about the future.